The six-lane boulevard in front of Akiva Schaffer's crummy Los Angeles apartment gave off a freeway-like roar, a backbeat to the old cars he and his two roommates drove, the canned chili they ate, the dead-end jobs they worked, and the comedy shorts they churned out at night, in which they were writers, actors, and directors. 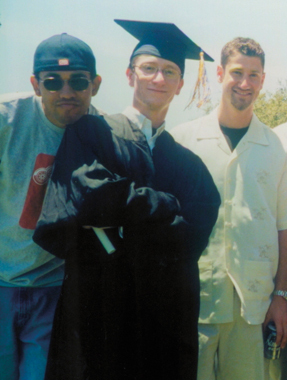 Little did Schaffer (Oakes '00, film) know, but those nights with his high school buddies—Andy Samberg and Jorma Taccone—were actually prep work for a career that would lead them to a stint on Saturday Night Live, a series of iconic music video parodies, movie credits, and even a role as cultural touchstones for the Internet era. "We were putting ourselves through boot camp without any idea of what we were doing it for," Schaffer said of those years, which became the genesis for the now-famous Lonely Island comedy troupe he started with Samberg and Taccone. "We were training ourselves for the jobs we got." Born in Berkeley of transplanted New York parents, Schaffer was a "shrimpy, short, white guy in a school that was not full of shrimpy, short, white guys," he said. He, Samberg, and Taccone bonded over their mutual shrimpy-ness and their love of movies like The Jerk, Austin Powers, and Airplane. After he graduated from UC Santa Cruz—where Schaffer studied computer science for two years and also, he said, received a good grounding in filmmaking—the three friends moved to Los Angeles, resisted the lure of sitcom-writing jobs, and churned out overnight comedy videos. "We didn't mind being broke and really wanted to take a shot at having our own voice the way Monty Python or the Zucker brothers or Woody Allen did," said Schaffer, as he drove to his Los Angeles office from his Hollywood Hills home. 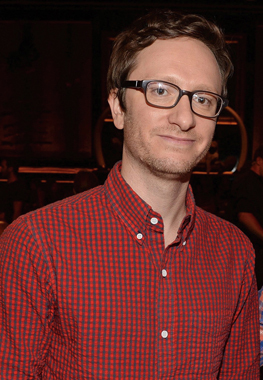 In 2005, Schaffer and Taccone were hired as writers for Saturday Night Live while Samberg (who studied at UC Santa Cruz 1996–98) got an acting spot on the show. That December, the trio created a rap parody video titled "Lazy Sunday," about a couple of lame guys planning to get some cupcakes and go to a Sunday afternoon matinee of The Chronicles of Narnia. The video was broadcast on SNL. It was also posted on what was then a little-known, video-sharing site called YouTube. Five million views made "Lazy Sunday" the first viral video. The phenomenon was arguably a tipping point for YouTube, and also pushed traditional broadcast media into the digital age. The Lonely Island went on to produce more parody videos, was nominated for three Grammys, and saw the men also branch out into their own careers. Samberg became a movie and TV star, Taccone went on to direct the movie MacGruber, and Schaffer directed feature films, including the 2012 The Watch, starring Ben Stiller, Jonah Hill, and Vince Vaughn. He, Taccone, and Samberg are now working on a music-centric film acquired by Universal and produced by Judd Apatow. The three are writing the script and music, and Schaffer and Taccone will co-direct—just like old times. "It's all good when we're apart (for different projects), but when we get back together and start working, that's our thing," Schaffer said. "It's always clear then that we're at our best and doing what we're supposed to be doing." Little known fact: The name Lonely Island came when Jorma Taccone brought the video Cat on a Hot Tin Roof to the trio's low-rent apartment on a noisy Los Angeles street. Samberg and Schaffer made fun of Taccone for being so theatrical. He left, and the pair watched the movie, inspiring Schaffer to write a prank Tennessee Williams one-act play with lots of overwrought analogies, metaphors, and drinking. Schaffer called it The Lonely Island, referring to their apartment, which was located in a sea of speeding traffic. The name stuck for both the apartment and the group.